It took me about five minutes to find my first significant iTunes 8 bug. Really, if Apple were to pay me $100K to test their products prior to release, they'd save a bundle. I have a gift for these things. The bug has to do with the organization of podcasts. So the Podcasts are in place, and my smart albums display both the podcasts and my other IOT AAC files together. The bug appears to be with a Podcast that is somehow split over time into two parts. The first screenshot displays both icons, but the episodes associated with the top icon are not displayed. If one clicks on the titlebar that seems to have no children, however, a podcast will still play. Your topic on Apple Discussions has be archived preventing discussion there. The two icons thing arises, I suspect, because of the change in the album/podcast title, plus the fact that you've switched to ascending release date. 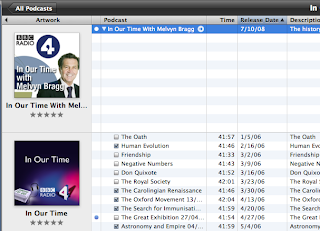 The current Podcast heading with its associated image is listed first. 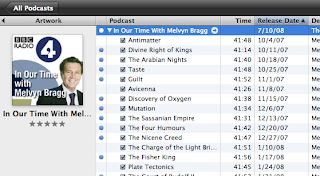 Because the first of the podcasts in your chosen order has a different album title a new image is generated with a divider above it. If you scroll down the page you should find another album divider & image where it begins to list the more recent episodes.